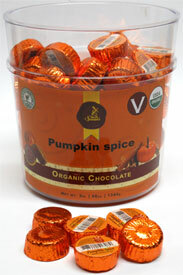 A new individual bite-sized sweet treat from Sjaaks, they take their delicious vegan rice milk chocolate cups and fill the center with a generous portion of creamy pumpkin spiced caramel for a delectable Fall season treat. Each 14g (1/2 oz.) chocolate is $0.89, or save when you buy 12 or more for $0.80 each! From WFT of Phoenix, Arizona on 10/29/2015 . From Anonymous of Waukesha, Wisconsin on 10/1/2014 . Allergens This item is manufactured in a facility that also processes coconut, peanuts, tree nuts, and dairy protein.